Tides. Charts and Graphs. Extended data, light, fast format. 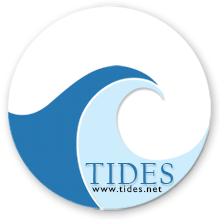 Saltwater tide tables and graphical tide charts to 1000's of US sites. Connecticut, Delaware, Florida, Georgia, Maine, Maryland, Massachusetts, New Hampshire, New Jersey, New York, North Carolina, Pennsylvania, Rhode Island, South Carolina, Virginia, Washington D.C.